Pillow inventor Mike Lindell has dealt with worse than the current controversy surrounding his support for Fox News host Laura Ingraham — a decade ago he was hitting bottom as a longtime drug addict. Now President Donald Trump holds him up as an entrepreneurial example. The pillow salesman had so much crack cocaine pounding through his bloodstream he hadn’t slept for two weeks, he would later say. Even the drug dealers were counseling Mike Lindell to slow down. It was March 2008, and the Minneapolis-area entrepreneur’s life was in free fall. Marriage broken. House lost. 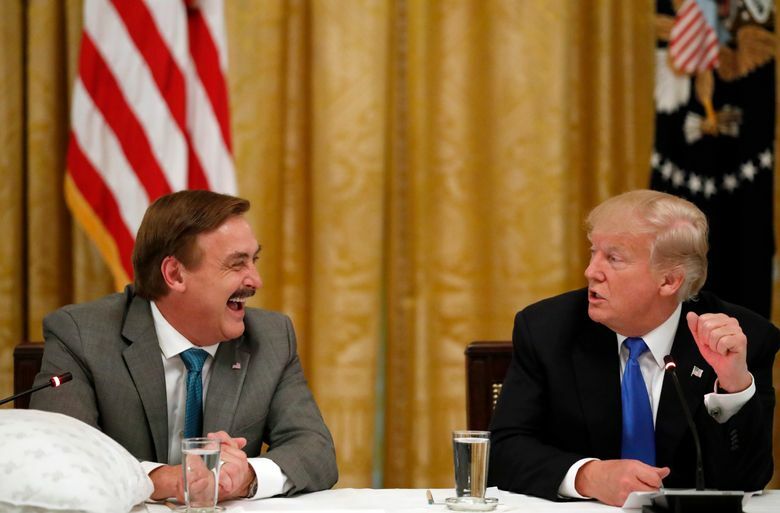 Business — a company he started four years earlier called MyPillow — struggling. Two weeks into this particular bender, Lindell went to his usual drug dealers for a fix. But the guys had already put word out on the street: No one sell to Lindell until he sleeps. Instead, he sneaked outside to score elsewhere. But no one wanted his business. Lindell waved around a $100 bill for $5 worth of crack. Nothing. He tried to hide his distinct mustache behind his hand. No luck. “I get back to the apartment, and [the dealer] is sitting there, and he goes, ‘How’d that work out for you?’ ” Lindell explained to CNBC last September. His dealer picked up Lindell’s phone and snapped a photo of the addict’s face — walking dead skin tone, disheveled hair, mug shot scowl. It was a memento of what it looked like at rock bottom. Lindell got clean the next year, and powered ahead with MyPillow, turning an idea plucked from a dream into a successful international business claiming nearly 30 million sales. For years he struggled against addiction and long business odds. Today, Lindell finds himself up against a political backlash. Recently, Fox News host Laura Ingraham hopped on Twitter to blast David Hogg, the Parkland massacre survivor turned gun-control advocate. The comments — about Hogg’s college rejection — quickly sparked outcry, with at least 18 advertisers pulling their spots from the host’s show, according to Media Matters. “Advertising decisions are based on what’s best for MyPillow, my employees and my customers,” Lindell added in a statement to the Shakopee Valley News. In response, there’s been a call online to boycott Lindell’s own business. The Minnesota businessman, whose mustachioed face is familiar from MyPillow infomercials and ads, has now found himself in the national debate. It’s the latest stop in a quintessentially American wild ride, a journey that’s run from pig farms and Las Vegas card tables to QVC and the gold-plated halls of Mar-a-Lago. As Lindell tells it, his success has the classic Horatio Alger shape — with cocaine and infomercials and divine inspiration. Raised in Chaska, Minnesota, Lindell spent a quarter at the University of Minnesota before dropping out, CNBC reported. He jumped from one business idea to the next in the following years, often pulling ideas from his experience. After his sister’s apartment flooded, he started a carpet-cleaning company. He heard about the success of lunch-wagon businesses in California; he tried the same concept in the Twin Cities. Lindell also tried to fill his pockets counting cards at Las Vegas casinos and raising pigs. Eventually, he started pouring drinks behind a bar and eventually purchased the business. “Probably wasn’t a real good idea because I was an addict at the time, a pretty hard-core cocaine addict,” he told CNBC. He started using cocaine in 1982, Lindell told the Salvation Army, switching to crack in the 1990s. He was still deep into his addiction when a lifelong sleeping problem pointed him to his million-dollar idea. Lindell never could find a comfortable pillow all his life. Then in 2004 he woke from a dream in the middle of the night with an idea for a pillow that would hold its shape. He jumped into the project, cutting up foam and material, learning to sew the pillows himself. When he finally had a finished model, he unsuccessfully pitched the items to chain stores. While struggling to keep MyPillow going, Lindell finally bottomed out Jan. 16, 2009. A devout Christian — today Lindell can always be seen with a cross dangling from his neck — he believed the MyPillow idea had come directly from God. He asked for the same intervention from above to end his addiction. Lindell says his desire to get high was gone. Infomercials would prove the key to ballooning the business. The 30-minute spots featured Lindell himself singing his product’s praises. “I want to come across as an average guy, talking to his neighbor,” he told the Star Tribune in 2014. Business picked up after the spots started running in 2011. “By the end of the year, we went from five employees to 500,” Lindell told CNBC. In 2017, MyPillow’s founder estimated the company had spent $100 million on infomercials, with 30 million pillows sold to yield $300 million in annual revenue. But the company has run into controversy. Prosecutors from nine California counties hit MyPillow with a lawsuit for running deceptive ads about the health and healing properties of the products. In 2016, the company settled the claims with $1 million in civil penalties, NBC News reported. Lindell has since said he believes the downgrade could have been motivated by his vocal support of Trump. Lindell was also invited to Trump’s 2017 inauguration, where he hobnobbed with other high-profile Trump backers like Stephen Baldwin and Scott Baio. The relationship has continued. Lindell was invited to Mar-a-Lago for dinner with the Trumps during the Easter holiday. “The president shook my hand and told me, ‘You are doing a great job, Michael.’ He also said he is sleeping great on his MyPillow,” Lindell told the Star Tribune. Despite millions in the bank and proximity to the Trump inner circle, Lindell still regularly talks about his crack cocaine days. As he told CNBC last year, he still keeps the photo his protective drug dealers snapped — as a warning. Lindell plans to use the photo as the cover of an upcoming autobiography. This story originally appeared on washingtonpost.com. Read it here.